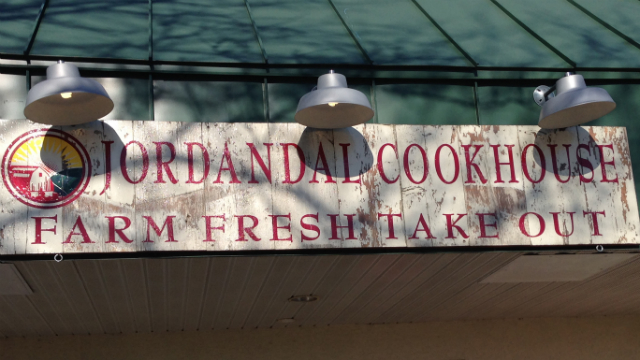 Based on the size of the Jordandal Cookhouse this blog should be super short but I have a surprisingly large amount to say about this tiny take-out restaurant in Verona. 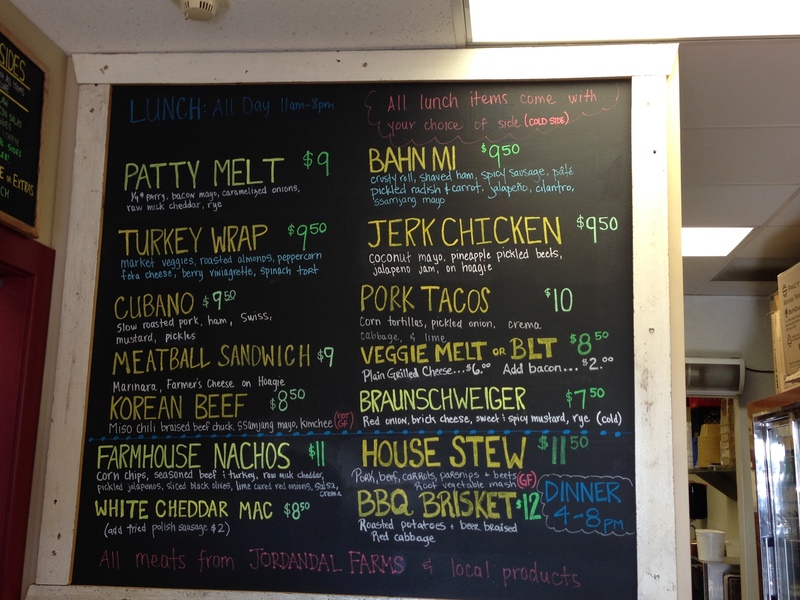 Jordandal Farms is known in the Madison area for locally-raised meat that they sell at farmers’ markets. But last year they opened a takeout restaurant in Verona that I have been excited to try for a while. It is a small little entry-way in a strip mall with a chalkboard menu, a front counter and two large coolers. The chalkboard menu lists a couple different options (mostly sandwiches) that all come with a side. There were a couple intriguing options but I have a thing for braunschweiger, so I couldn’t pass up the braunschweiger sandwich. It comes on rye bread with red onion, cheese and sweet and spicy mustard! That’s the exact way I make my braunschweiger sandwiches except I add tomato. For those of you who don’t know what braunschweiger is – it is a type of liverwurst that definitely takes an open mind and requires an acquired taste to enjoy it, but for some reason I love it! Most store-bought braunschweiger is kind of greasy and doesn’t have a great flavor, but every once in a while I find a good one that is lean and has a good combination of spices. 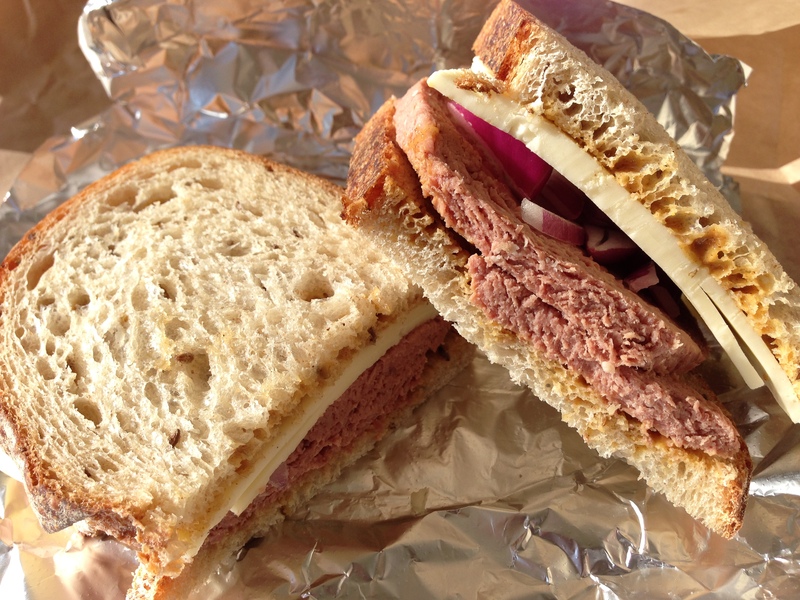 The braunschweiger at the cookhouse is just that – lean with a great flavor of spices! It was a great sandwich and the mustard was the perfect compliment for the strong braunschweiger flavor. I will definitely be back for this sandwich! My mom got the patty melt that comes on rye bread with bacon, mayo, caramelized onions and cheddar cheese. The sandwich was a nice size and had a good amount of ingredients on it, but it was dripping in grease. They must butter both pieces of bread before they toast them, making it so greasy we couldn’t taste the onions, cheese, mayo or bacon over the dripping butter. After I got sick of eating butter slathered bread I took it apart and ate the pieces separately, and to my surprise the beef patty was very good. The burger was nice and juicy but not greasy itself, and had a great seasoned flavor. 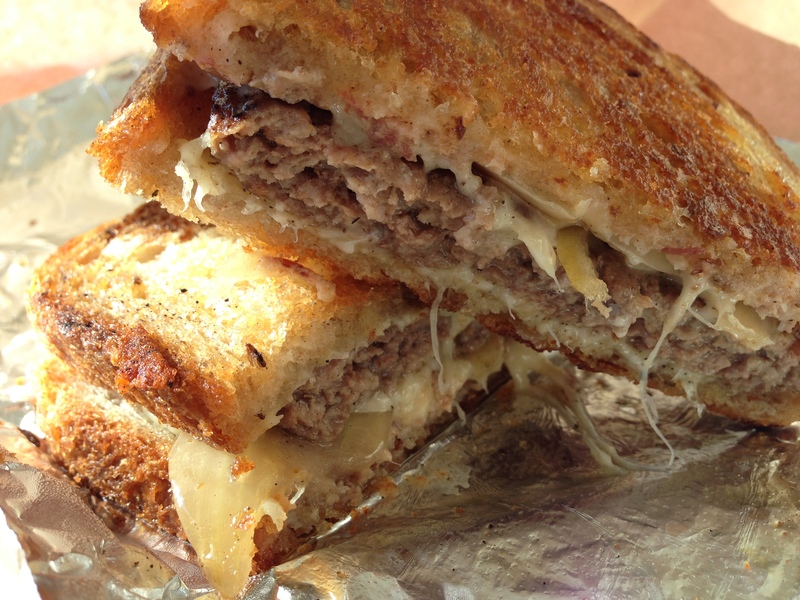 The patty melt could be a fantastic sandwich if they would reconsider the amount of butter used to toast the bread. 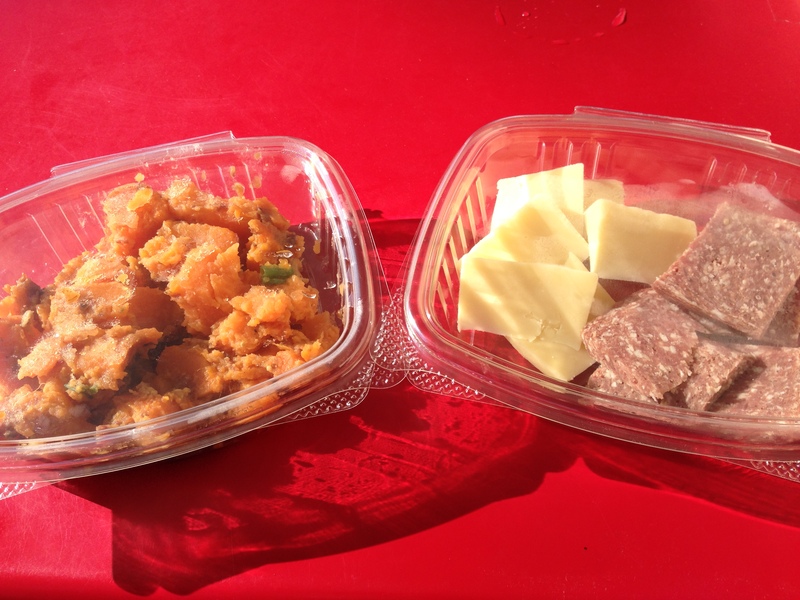 For our sides we chose a cold sweet potato salad and salami/cheese. The cheese and salami were very fresh and as far as we could tell (and with some digging from the girl working at the time), the salami is nitrate free. The cheese was a sharp brick cheese that matched the dry salami perfectly. The sweet potato salad was interesting. It was slightly mashed sweet potatoes with onions and some small pieces of bacon with a slightly sweet flavor. I’m not sure what they use to flavor the salad but I really liked that it was doused in dressing. FOODNOTES: The biggest thing to remember is that this is a carry-out place. There are no tables inside, but if it is a nice day out/summer, there are some picnic tables outside you can use. 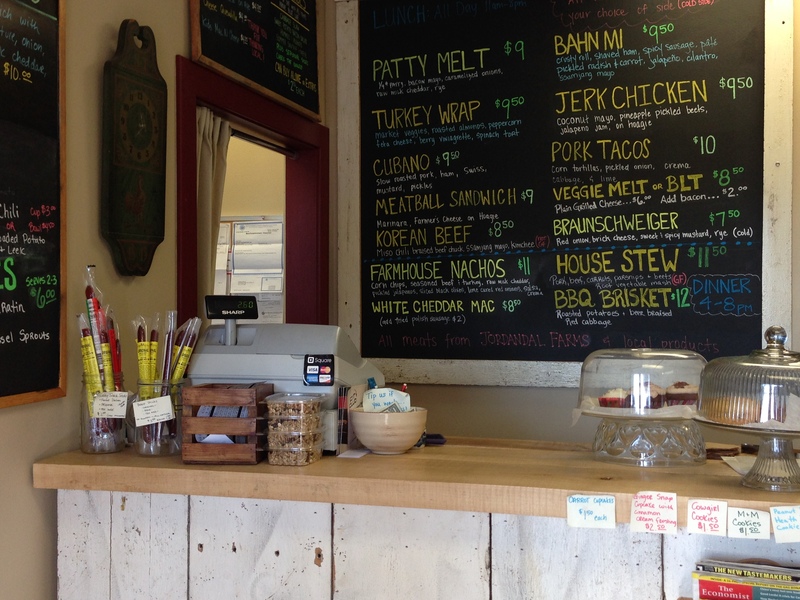 The girl working said the cookhouse also sells packaged meat and serves as a pickup location for meat orders. If you go, avoid the patty melt because the amount of butter they use overwhelms all of the other flavors. 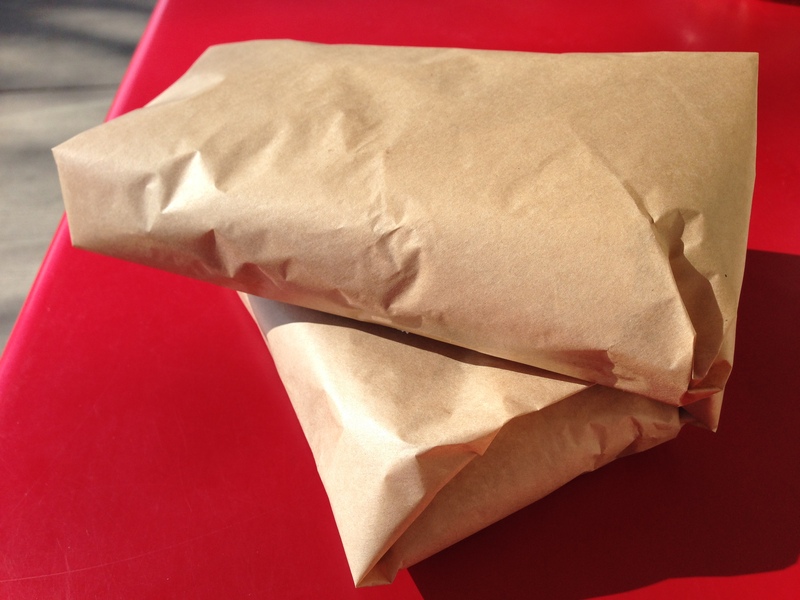 If you’re up for it…try the traditional Wisconsin braunschweiger sandwich. Some of the dinner specials listed that day (we couldn’t get them because we were there at lunch) looked very good; they had house stew, Wisconsin mac and cheese, and brisket — all worthy of being ordered I’m sure! Another interesting thing about the menu are the different culinary influences present – they have Korean BBQ and pork tacos on the daily menu. I’m not sure you could go wrong with any of their sides, but they do offer a homemade butterscotch pudding I’d like try next time I’m there. Prices are slightly higher than average but remember, you are paying for locally-raised meat on your sandwiches or for your dinner. Also, this isn’t a very vegetarian-friendly place, but they do offer a grilled cheese and their mac and cheese without the sausage.